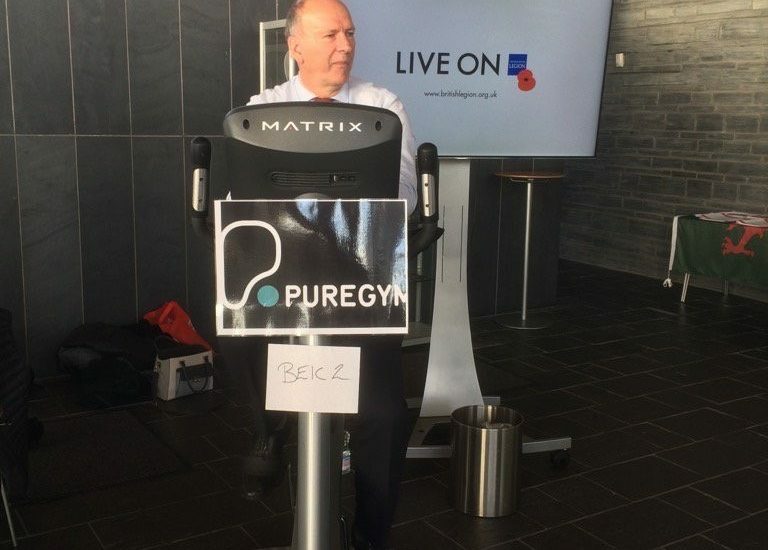 Yesterday (Wednesday 2 November) Aberavon AM David Rees joined the Wales Area manager of The Royal British Legion, veterans and other Assembly Members to race against the clock on an exercise bike to mark the Remembrance period in Wales and commemorate the Battle of Mametz wood 100 years ago. The bike ride was held from 09.30 to 18.30 in the Welsh Assembly’s Senedd building, aiming to mark this very special year for remembrance in Wales. David represented his local constituency and completed cycling a distance of 2.65 Km in the allocated 5 minutes. The bike ride was organised by The Royal British Legion in Wales and builds on the successful bike ride held in 2015 in Westminster hosted by the Industry and Parliament Trust, in partnership with the Legion. Members of Parliament also undertook the same challenge as the two legislatures aimed to collectively cycle the distance from Westminster to the Somme in France**, to mark this year’s centenary of the Battle of the Somme. The target of 296 miles was achieved at 18.15 after over 8 hours of pedaling from everyone involved. David Rees AM said: “I would like to thank the Royal British Legion in Wales for arranging this event, once again reminding us of the sacrifices made by many service personnel as they served our country to ensure we are able to enjoy our freedoms today. The Royal British Legion provides invaluable support to the Armed Forces community and I am pleased to have been able to support such a worthy cause’. Wales Area manager Ant Metcalfe said: ‘We were delighted to welcome David Rees AM to our first ever Poppy Ride in Wales. This was a new, and different, way of marking the Remembrance period alongside all of the other vital local and national events the Legion is involved with at this time. 2016 marks the centenary of the battle of Mametz wood – so important for the people of Wales – and we hope this event has brought us all together to remember and also raise awareness of those who continue to requires the Legion’s support today’.